A Business letter is a formal letter usually written between two businesses, or between a business and it’s clients. 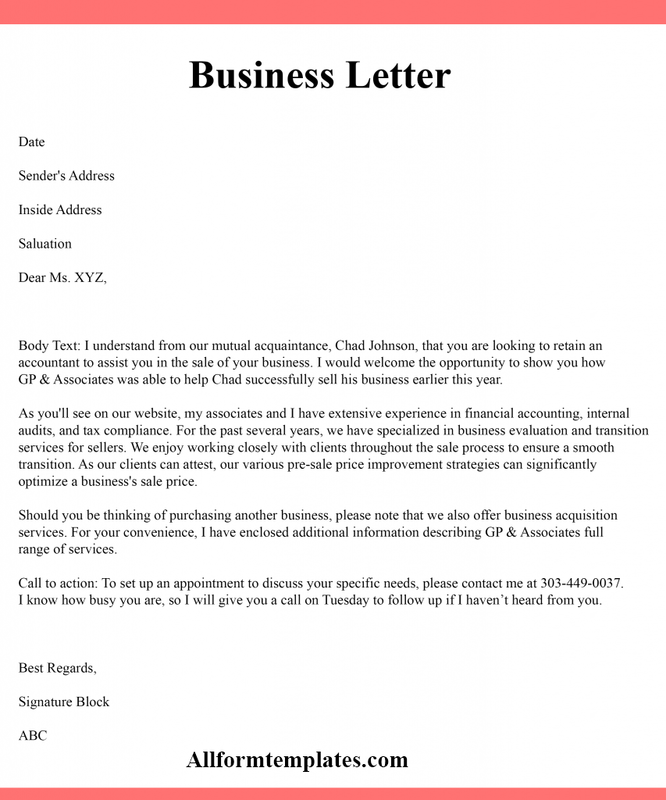 So here today we bring you business letter template in PDF format. If you work in the corporate sector or own a business, you would know that businesses need to frequently communicate with other businesses or their clients on a regular basis. Hence writing a business letter is necessary for the smooth functioning of a business. It represents the official communication of a business with other businesses or clients. So it is must that it should be written in a proper format and language. So here we shall provide you with some useful templates regarding various situations where a business letter is written. Preferably write the letter in your business letterhead. Then comes the body of the letter. In the first para itself, explain your motive of writing the letter and your expectations from the receiver. Make it crisp yet detailed. So these were some useful tips to write an effective business letter. Using these tips and taking reference from the sample business letter we have provided you. These templates can be edited so you can download it and make changes to it as you want. A business letter is generally written in a formal manner, but it can be written in a casual manner depending upon the nature of the relation between the businesses. But whatever be the reason for writing the letter, the letter must not touch personal topics and must stick to the intention for which it is written. It must contain strong and influential language since it represents the company and can affect the reputation of the company. A well-written business letter has the power to influence the reader’s decision and can convince them to enter into a contract with the company. Here we are providing you with samples of business letters which you can access in PDF format. These are written in an editable format, so you can add any details as per your choice or use them as a reference. Writing a business letter is an art, which everyone cannot perfect. It covers a wide range of letters, from complaint letters for poor service, business letters for students, to formal communication in the corporate sector. 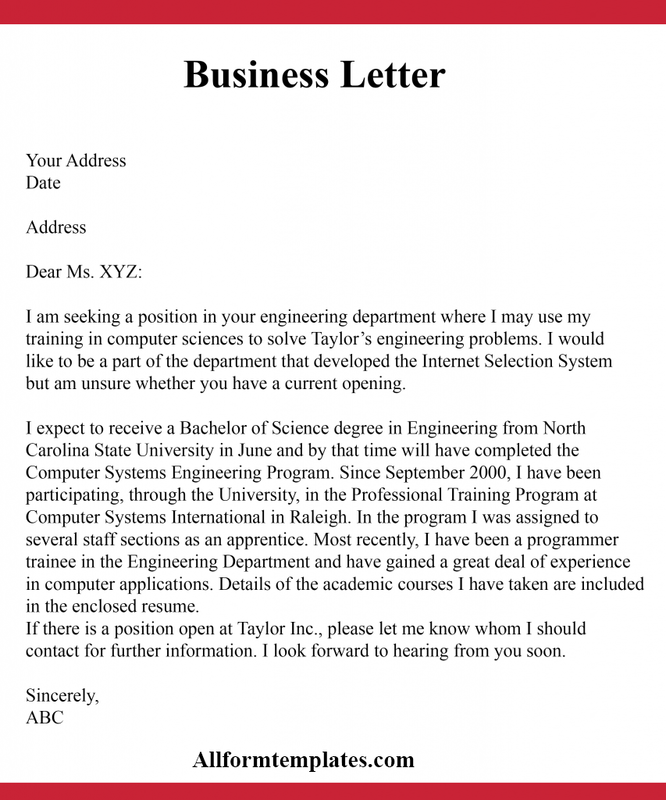 Some examples of the commonly written business letters are recommendation letters, complaint letters, invitation letters, etc. The advent of business letters has ushered a new era in formal communication, wherein the business is not hampered by a lack of means or delay in communication. In other words, business letters are relevant to every business or any type of formal communication. So here we have given you some tips on how to write an effective business letter. We have also provided you with some useful templates for your free access which will help you understand the structure and style of business letter better. 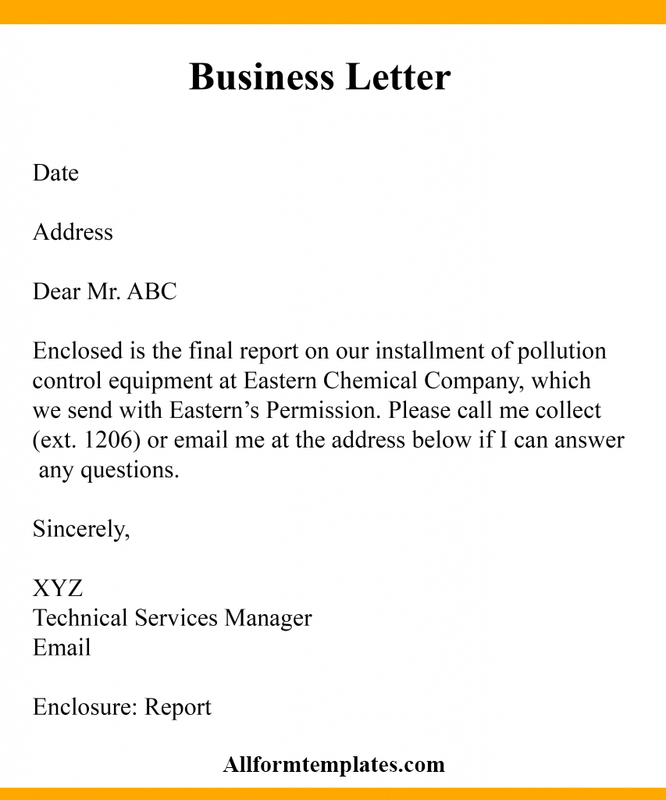 Now here we have provided you with some templates of a business letter which are commonly used in our everyday lives. You can use these as a reference to understand how to write an effective business letter. These are also available for download in PDF format.